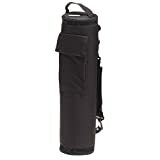 A golf bag cooler keeps your beverages cold while you enjoy your favorite sport. 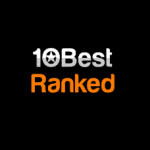 We spent countless hours reviewing and researching the offerings on the market to arrive at the five best choices available right now. Why? Golf bag coolers are crucial to a positive experience. The only thing better than spending a day out on the golf course is being able to enjoy a cold soda or beer as you play (Source). These golf bag coolers make it possible to bring along your beverages of choice, so you don’t have to drink warm sodas or beers every few holes. The best feature of the Callaway Golf Cart Cooler is the Velcro closure at its top, which gives easy access to the drinks. When empty, the size of the cooler is just 3 inches, so storage is a breeze too. 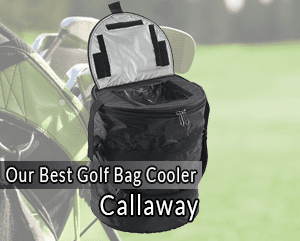 The Callaway Golf Org 14 Cart Bag features two insulated cooler pockets, which will keep both snacks and beverages cool when you’re out playing an 18-hole round. There are 10 pockets in total, including one for a GPS or rangefinder and a water-resistant one for valuables. The 14-way top as full-length dividers so all of the player’s clubs will stay organized and well-protected. The two integrated molded grab handles make transport from the vehicle to the cart and back easy. Other useful features include an umbrella sleeve and an attached multi-function tool, which can be used as a bottle opener. The product is available in eight different colors. Between nine and twelve 12 ounce cans can fit in the main cooler pocket depending on your needs. The sleeve pocket can accommodate another 2-3, providing more storage area than a standard cooler bag. The above-mentioned multi-function tool will come in real handy if you prefer bottles to cans. This tool also serves the purpose of a hook for accessories. The absence of a drain hole is a disadvantage of this cooler. It does have a nice exterior slot for tees, making them easy to access. Some minor complaints revolve around there not being any pen holder. Size does matter when it comes to golf bag coolers, and Callaway appreciates this fact. The cooler features a full size thermal-lined pocket, making it one of the biggest golf bag coolers on the market. On the downside, this can make the bag bulky and compromise its balance when trying to position it upright. The bag itself is highly recommended for cart users. If you don’t use a cart, it may not be the best option because some people have complained of the bag not being able to stand upright. All in all, we find this is a stylish, efficient, and convenient choice. Our second choice, the Bag Boy Golf 2017 Chiller Cart Bag Cooler, is a great option if you want to bring a few extra beverages with you on the course. This removable, insulated cooler can hold up to six cans of 12 ounces each. Of course, the cooler bag can also be used for food that you need to keep cold. The bag features a total of nine pockets, including one for valuables, two big ones for accessories, and one huge ball pocket. This cooler definitely offers enough storage room for a full day out on the course. The bag also has a 14-way top with full-length separate dividers. This product was the Golf Digest Editors’ Top Choice recently. The bag fits right into the cooler pocket, which contains draining ports, unlike our top choice. The bag is made of 420 Denier nylon and comes with a single, ergonomic shoulder strap for easy carrying. Our third choice is considered one of the best golf bag coolers on the market by many. The bag itself is also of superior quality. The cooler can fit up to six 12-ounce cans. Ice packs can be accommodated as well. The 15 way full length divider bag features 11 pockets in total, including 2 velour-lined ones for valuables and 2 for large apparel. The cooler has many excellent reviews for its innovative design, among other things. The pockets can be used to hold a rangefinder, and you can open them effortlessly with one finger. There is also a pocket that provides access to the bottom of the dividers in case an item falls inside. This way you won’t need to tip over the bag to empty it in order to get what you dropped. Like the next product on our list, Ping Pioneer features a customizable zip off ball pocket panel. It also features a pen holder and a Velcro strap, which is a rarity users truly appreciate. The product also includes many hallmark features like integrated lift handles, a dedicated umbrella sleeve, cart straps, and a towel ring. The product comes in 5 different colors, with the black and blue versions being the best ones. One slight downside is that the cooler does not have a drain hole and condensation and moisture tend to build up as a result. The FlexiFreeze has 60 FlexiFreeze laterally inbuilt ice cubes, which are made of purified, filtered water that does not contain any chemicals. You put the bag in the freezer to freeze or keep the ice cubes frozen. All you need to do when you’re ready to head out to the golf course is place your beverages in the cooler, which can hold up to four 12-ounce cans. Truly a unique solution. 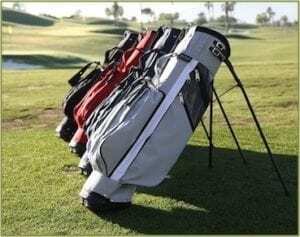 The cooler straps to the golf bag easily and conveniently and will keep them cold for up to 10 hours, which is more than enough time for a good round. The cooler is also reusable and easy to clean. It is easy to carry around the course even if you don’t use a cart. Our final choice, the Taylormade Supreme bag cooler, is about average considering the bag size and will fit four or five 12 ounce cans. The important feature of the cooler pocket is that it is equipped with a drain port, allowing the moisture, condensation, and excess liquids to be filtered out. The bag has a total of 10 pockets, including two lined with micro suede to hold valuables and provide protection for important and sensitive items such as electronics. Taylormade has a 15 way top divider, but only 4 full length. This is a very robust cooler with a quality tarpaulin reinforced pass-through strap for carts preventing amortization. It also features a 10 coil strength zipper on the pockets. The pockets have zippers, making it possible to embroider them with personalized touches. The bag and cooler can be worn over the shoulder bag, but they are more recommendable for cart use. TaylorMade Supreme comes in 5 different colors. The TaylorMade Supreme’s big insulated cooler pocket features a drain port, offering the additional benefit of keeping your drinks and snacks cool at all times. The rain hood keeps clubs dry on rainy days, and the convenient trunk handle ensures easy transporting in and out of the vehicle. 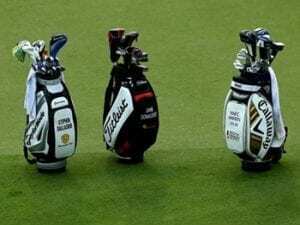 What should you look for in a golf bag cooler? Below are some tips to help you make an informed choice. The first aspect to be taken into account when choosing a golf cooler is how you plan on using it. How do you and your fellow golfers cover the course – by cart or on foot? You need to know whether you will be walking from hole to hole or using a cart if you haven’t been golfing yet. A bigger cooler obviously wouldn’t be the best choice if you’ll be walking, as loading it to its maximum capacity might mean it might get too heavy and become impractical. This issue can be remedied by using an ergonomically designed cooler that can be worn on the back or over your shoulder, but attachable coolers may add too much weight. Weight isn’t a problem if you’re traveling from tee to tee using a golf cart. Some golf coolers, like our top choice, can collapse for easy storage, yet can hold up to 12 beer or soda cans or up to 9 average-size wine bottles when unfolded. A cooler like this in the back of the cart is a great idea, but it can’t be carried conveniently once laden with the beverages and/or foods of your choice. Another thing you need to consider is whether the cooler has additional storage pockets for tees, balls, score sheets, and more. Alternatively, you can go for a golf bag with a dedicated cooler pocket. Both options have their pluses and minuses: a real golf bag offers more golf supply storage space, but adding a cooler means greater weight. The small sacrifice that comes with choosing a bag equipped with a cooler that serves two purposes means less added weight than would be the case if you were to use two separate storage systems. The majority of golf courses prohibit the consumption of alcoholic beverages during the game, but not all of them actually enforce their official alcohol policies. There are multiple golf coolers available that can help to conceal your activities if your course of choice monitors for illicit drinking or if you just want to be discrete in your imbibing while on the course. The easiest, most effective way to transport drinks onto the golf course discretely is to use a golf bag that features a built in cooler pocket. 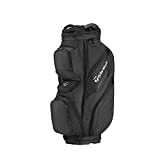 These bags look like normal golf bags for all intents and purposes, while their pockets feature handy drainage ports most of the time and are well-insulated. What is more, you can use the cooler pocket conveniently for other gear when not filled with drinks and ice. You can also opt for a slim cooler that attaches to your golf bag with a hook and looks much the same as a regular golf bag. But there is a sneakier, subtler approach to be considered as well: there are coolers comprised of a long, thin beverage reservoir and a tap shaped like a golf club. You can slide this tap down into the golf bag for maximum discretion with drinking. Keep in mind the cooler has to be filled with your beverage of choice in advance, which may cause loss of carbonation. If you try to clean it with something other than water, it will get sticky. We hope you enjoyed our list of the five best golf bag coolers. Each of the products reviewed here will suit your golfing needs. We wish you best of luck with your game. Share your experience here with us in the comments section down below.